Today Neo Technology, makers of the NoSQL graph database Neo4j announced that it has raised a $11 million Series B led by Sunstone Capital with participation from previous investors such as Fidelity Growth Partners Europe and Conor Venture Partners. The company, founded in Sweden in 2007, previously raised a $10.6 Series A last year and $2.5 million in seed funding back in 2009. There are a few different types of NoSQL database. NoSQL is really a misnomer for non-relational database, so practically anything that doesn’t follow the relational model counts. Here’s one way to think about it: a relational database is sort of like a spreadsheet, with multiple columns and rows and different sheets or tables. Another type of non-relational database is the document database, which is actually more like a collection of documents than a spreadsheet. Each document can have its own structure. 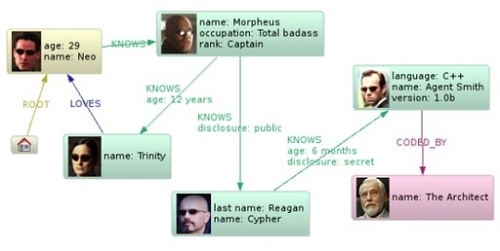 Kollegger says that Neo4j did get its name from The Matrix, but the open source project actually got its start at the Swedish military. It was originally conceived as a way to provide information about the relationship between documents and people in a content management system. It’s now spread far beyond its roots as a small project for the Swedish military. It’s being used for everything from the Center for Disease Control’s SmartCare project in Zambia to statups like Glassdoor. And it’s starting to show up in large enterprises as well. “A year ago we had a handful — two or three — enterprise companies,” says CEO Emil Eifrem. “Now we have over 20 Global 2000 enterprises.” Those companies include Cisco, which replaced its Oracle RAC based master data management system with Neo4j, and Adobe, which uses it as part of its Creative Cloud offering. Despite the widespread interest in other types of NoSQL databases such a the BigTable-clone Hbase and the document database MongoDB, Eifrem says that he never sees Neo4j competing with other NoSQL databases in bids. “It’s always Oracle RAC or a homegrown solution,” he says. Next week the company is sponsoring the first Graph Connect conference on graph database technology.